Here we listed and reviewed the best via ferrata equipment currently available. Via ferratas (also called iron trails) are very steep and exposed trails that have steel cables running along them. The steel cable allows you to attach yourself to it with a via ferrata set and a climbing harness, and thus reduce the risk of a fatal fall. 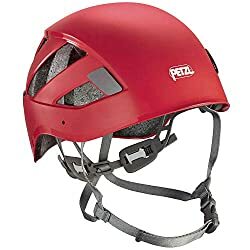 Additional via ferrata equipment includes a climbing helmet for protection against falling stones, via ferrata gloves for firm grip and good footwear for stability and traction on rocky terrain. In the following we selected and reviewed the best product within each category of via ferrata equipment. If you are new to via ferrata trails, you should first read our article How to Use Via Ferrata Equipment to understand how via ferrata equipment works (the article includes many photos and a video for better understanding). A via ferrata set is used to attach your climbing harness to the steel cable that runs along the trail. It consists of an attachment loop, energy-absorption system, two lanyards and two carabiners. 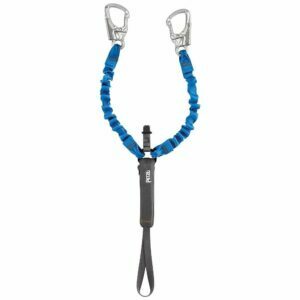 The attachment loop allows you to attach the set to the climbing harness while the carabiners can be hooked to the steel cable. The energy-absorption mechanism is the most important part and ensures that a potential fall would be stopped gradually rather than abruptly, resulting in injuries. There are different types and designs of via ferrata sets, but modern via ferrata sets mainly have the so-called V design and a tear-out webbing for energy-absorption. 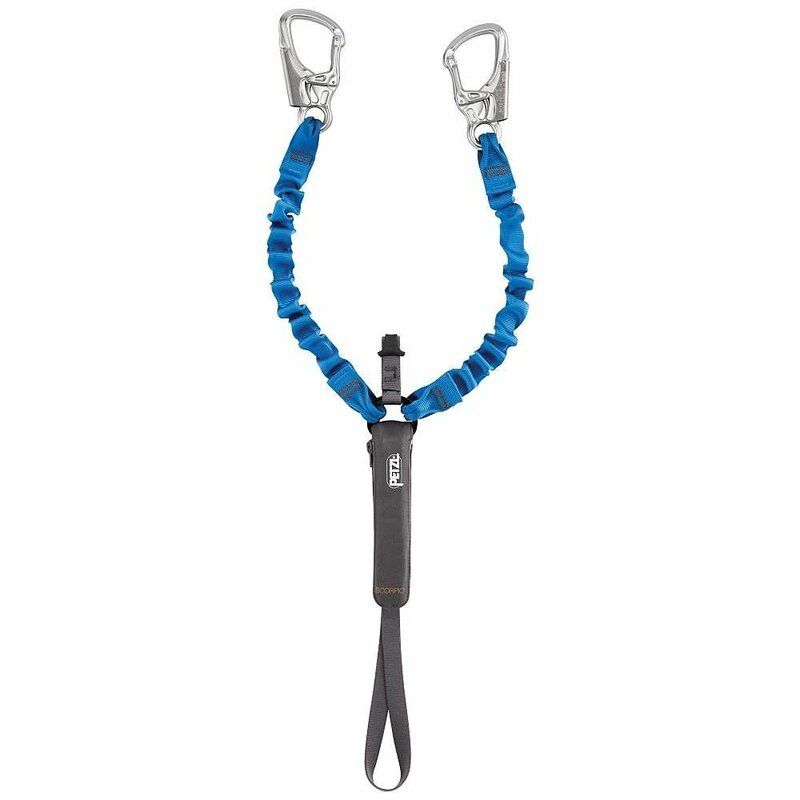 We recommend the Petzl Scorpio Eashook via ferrata set because it offers great functionality. The set has two Eashook carabiners, two retractable arms and a tear-out webbing shock absorption mechanism. Furthermore, the set is equipped with an additional short arm (seven centimeters long) for pauses along the trail. The Eashook carabiners allow you to quickly pass iron rods as they have large openings for easy attachment to the cable. They also don’t need to be screw-locked. The retractable arms measure 60 centimeters in length when they are extended and therefore, they offer great freedom of movement. When retracted they measure only 36 centimeters in length, so they don’t get in the way during the ascent. The tear-out webbing is stored in a pouch for better protection. The pouch can be opened to inspect the condition of the tear-out webbing. The additional short arm comes in handy for rest phases – as it measures only seven centimeters in length, it keeps you in place while you drink, eat etc. However, the short arm doesn’t come with a carabiner – you need to purchase the carabiner separately. 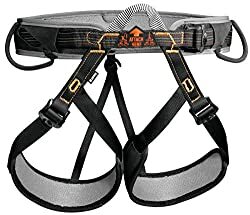 There are three different types of climbing harnesses – sit harnesses (worn around the hips), chest harnesses (normally worn together with sit harnesses) and full-body harnesses. For via ferrata trails mostly sit harnesses are worn. However, if you are planning to carry a heavy backpack you might want to wear a full-body harness. 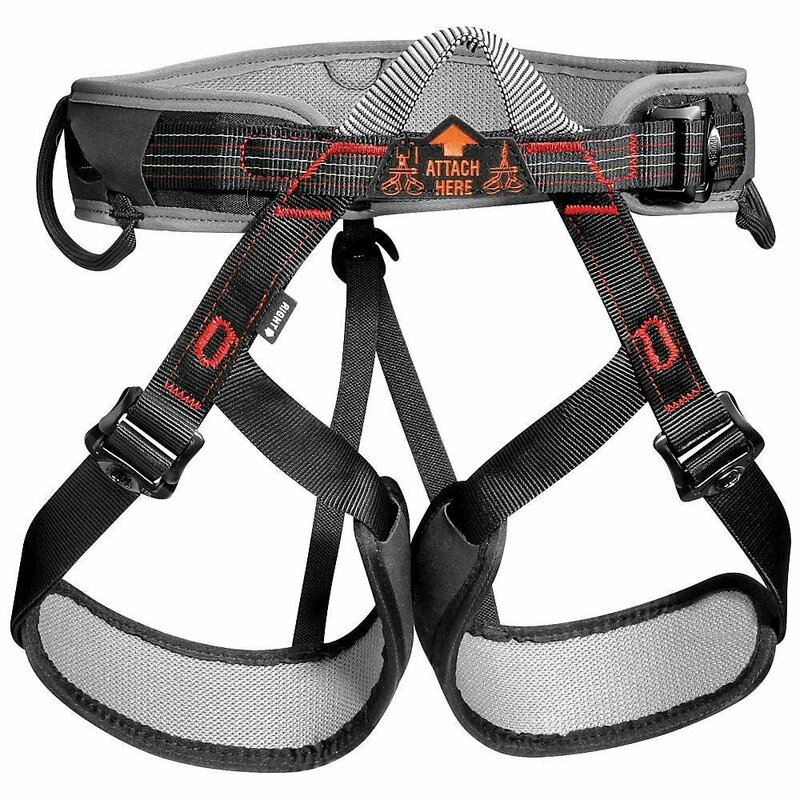 The gravity points of full-body harnesses are placed higher than at sit harnesses. If you carry a heavy backpack with a sit harness, you could suffer additional injuries in case of a fall as the weight of the backpack could yank you backwards. We recommend the Petzl Aspir climbing harness (sit harness) but only for trips without a particularly heavy backpack. The Petzl Aspir climbing harness is very light and comfortable – also during rest phases because it has foam padded leg loops and waist belt. The leg loops are adjustable and thus you can easily put the climbing harness on without first taking off your boots. Furthermore, due to the adjustable leg loops, the climbing harness will fit comfortably regardless of the clothing you wear. The climbing harness is equipped with a single tie-in point which allows you to easily attach the via ferrata set with a carabiner or a cow hitch knot. The climbing harness comes in three different sizes – M (fits waists from 53 – 72 cm), L (fits waists from 68 – 94 cm) and XL (fits waists from 86 – 110 cm). Falling stones are very common on the generally steep via ferrata trails and therefore via ferrata trails require a helmet. 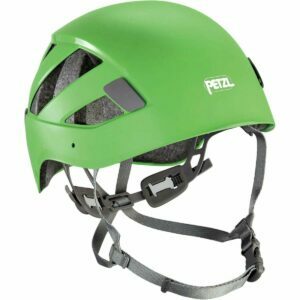 We recommend the Petzl Boreo climbing helmet because it is not only light and comfortable, but it also provides good protection. The helmet has an ABS injected shell and foam lining. The headband is easy to adjust even while you are wearing the helmet. It also has an adjustable chinstrap. The helmet features relatively large vents for comfortable wear in warm conditions. It also has integrated clips for attaching a headlamp and comes in several different colors and in two different sizes; size M fits head circumferences from 48 to 56 centimeters and size L fits head circumferences from 53 to 61 centimeters. Gloves are worn on via ferrata trails for better grip. 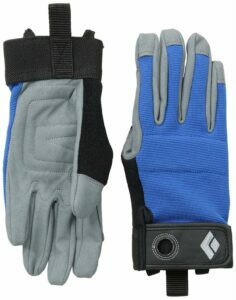 They also protect your hands against blisters which can occur due to the friction between the skin and the cable/rock. Furthermore, they provide insulation which is very useful because steel cables are usually much colder than the surroundings. We recommend the Black Diamond Crag gloves which are designed especially for via ferrata trails. The gloves have palms made of synthetic leather and thus they provide a firm grip. The upper part is made of mesh fabric for good breathability. The knuckles are padded to protect your hands from abrasion from rocks (when reattaching the carabiners for example). The gloves are inexpensive and available in three different colors – red, black and blue. Please note that these gloves do not provide sufficient insulation for doing via ferrata trails in winter (although many via ferrata trails are not even accessible in winter as the cable is covered with snow). If you need a pair of insulated winter gloves check our review of the Best Gloves for Hiking and Mountaineering. For via ferrata trails you need a pair of robust and relatively stiff mid- or high-cut boots. Such boots have uppers made of leather (full-grain or nubuck) to provide good durability and abrasion-resistance. They typically have PU midsoles which are stiffer and more durable than the more commonly used EVA midsoles. 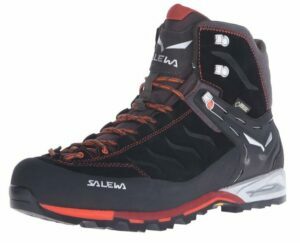 We recommend the Salewa Mountain Trainer Mid GTX boots for via ferrata trails. 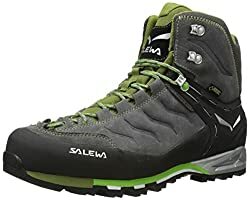 The Salewa Mountain Trainer Mid GTX boot is designed for technical hiking and features nubuck leather upper. Therefore, it provides good breathability and abrasion resistance. The boot is additionally protected against abrasion with an all-around rand made of polyurethane. For good ankle support the boot features the 3F System (semi-stiff rubber inserts in the ankle area). The lacing comes right down to the toe (climbing lacing) for a more precise fit – which you will appreciate when ascending technically challenging trails. For more footwear options check out our selection of the Best Backpacking Boots which includes five different pairs of boots – all of them suitable for via ferrata trails. For general information about footwear read our Guide to Hiking Footwear. A via ferrata is a technically difficult trail that has a steel cable running along it. Additionally it might be also equipped with holds, ladders, bridges and carved footsteps. Via ferrata trails allow you to reach technically challenging summits without advanced climbing skills. 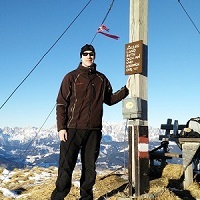 Therefore, they are becoming increasingly popular among hikers and trekkers. However, via ferrata trails are not suitable for those who are afraid of heights as the path will often lead you up nearly vertical rock walls. Via ferrata means iron trail in Italian and the first such trails were “built” in the World War I by the Italian army. They allowed soldiers to reach difficult peaks where they established observations points to monitor the enemy’s activity. After the World War I many new via ferrata trails were established – mainly for hikers and mountaineers. Where are via ferrata trails? There are many via ferrata trails in Europe – especially in the Alps. However, you will also find via ferrata trails in the United States, New Zealand etc. 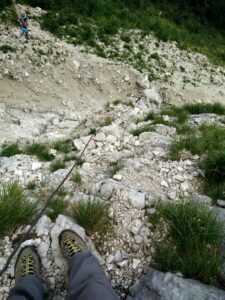 Also check out via ferrata trails reviewed on Best Hiking (they all come with GPS routes).